Centrifuges is widely used for oil gas driling, piling projects. In whihch applications, big bowl is more and more popular, eg. 30in decanter centrifuge GNLW764 from GN Solids Control is known to more and more piling contractors. In this CIPPE 2017, GN will bring one unit to Beijing. As for HDD projects, lots of people have tried, but it is not quite modularized, as too many different requirement based on that. For the strict applicaition, GNLW553, GNLW554 should be good options, because of the high flow capacity. Polymer is a good help for the not too high speed, concentrate the small solids, while lots of places do not like chemicals in disposal. Then if we can figure out what equipment is using before centrifuge, and how is the performance, then we will find out if we need use the centrifuge continuously or not, which is important for definning the capacity. A separate skid is a very flexible choice for HDD projects, as normally it is not in the system, not with the rig package, so far it is a customize solution. And with a flexible frame, will be easier to arrange the solids / liquid discharge. Contact with GN if you are in need of a solution. As a leader of solids control equipment manufacturers in China, GN keep investing on new products, and as keep providing good quality products, built our international brand name. In the past 2016, GN have made some quite new products which we did not manufacture before: the centrifugal degasser, and the vacuum transfer pump. 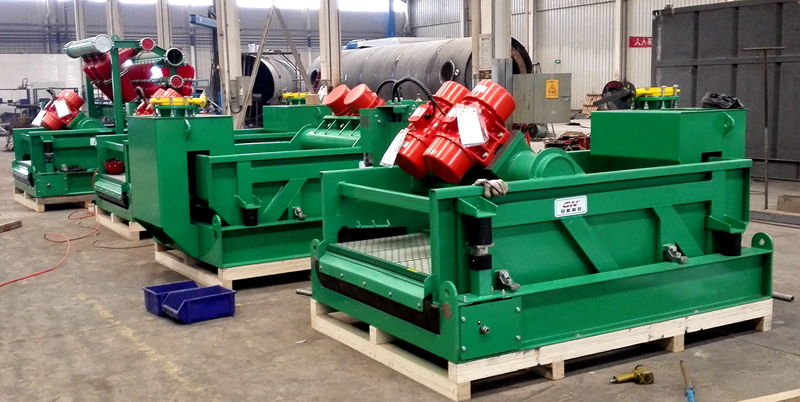 Couple weeks ago, GN finished the fabrication of centrifugal type degasser, this enriched GN’s production line. This centrifugal degasser is designed and manufactured after researching many types of degassers home and abroad. 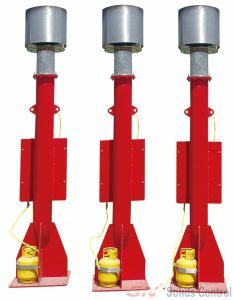 It could be used in all kinds of drilling fluids recycling system to remove the gas in the gas cut-in drilling fluids for recovering the mud property, stabilizing mud viscosity and reducing drilling cost. After a few project, keep buying the vacuum transfer pump, we finally decided to do some research and development on our own vacuum transfering. With our partners help, we finish and test it on site with good performance. One of the weakeness of Chinese shaker is we do not have a small sump underneath to make the fluids more flexible, to be able to flow to sides of the shakers, which also supposed to make things easier when design the mud tanks with mud ditch to easier balance mud flow. Now here it comes, we will show this type shakers in this exhibition, more details pls chase with our sales team. 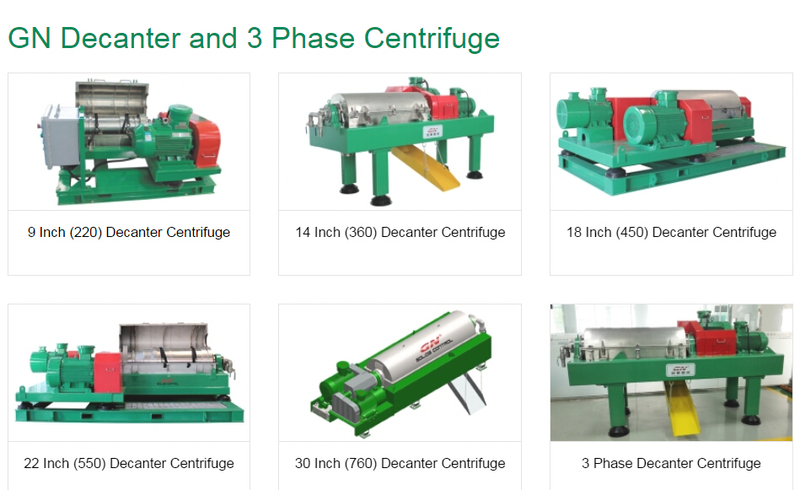 Decanter centrifuge is our main products, and keep improving, each and every year, it is also a highlight to our competitors even. If you are interested in more infomration, keep tune. Sludges that contain oil and water are generated via a sort of movements and procedures on board ships, including sedimentation in tanks, tank dewatering techniques, and leaks or cleaning cycles in backflush filters and separators for treating fuel oil and lube oil. The pattern for combusting excessive density gas oils of bigger viscosity, as good as the use of residues as a fuel for medium-velocity diesel engines, also increases the production of sludge from both fuel oil and lube oil. The construct up of those oil and water-containing sludges represents a enormous disposal concern. Options which have frequently been employed to maintain them comprise incinerating the sludge on board, or taking away it on land. Nevertheless, incineration is an steeply-priced process in view that the sludge has to be dewatered by way of evaporators and then mixed with priceless diesel oil to generate a combustible fuel. Disposal on land can be related to giant expenses, as the sludge has to be transported to a waste disposal website online, which in turn needs to be paid for. Hongkong, like Singapore, is small place with huge business potential, not only as a transport center, or a bridge for mixing the different culture to the world. While always some first taste of new. As the connection from long history, and the developing of China. More and more Chinese brand are recognised by clients in these places. 1. GN’s proposal is 3 unit shale shakers with treating capacity of 500 GPM, or even larger. The largest advantage of GN shale shaker is simple structure for easy operation and maintenance. Hollow type rubber for sealing between the screen panel and shaker deck ensures the cleanness of the mud. 2. After treated by the mud cleaner, most of the useless solids larger than 20 microns would be removed out. 3. Client could optionally choose the decanter centrifugeunit with dewatering container and equip into the mud recycling system to separate the ultra fine solids in the drilling fluids. GN have designed a big bowl centrifuge specially for the tunneling projects. By using the centrifuge unit, the driller could recover more drilling fluids. Let us know your requirement, GN can also customized a solution for your operation site.